In the early evening of March 26, 2019 the angels came down from the heavens and took our beautiful mother and grandmother home. Surrounded by her family Carmelita peacefully went to sleep. Carmelita was born to Rose Lambert and John Two Bulls in Poplar, MT on May 11, 1933. Mom was then raised by her grandparents Angeline and Charles Iron Bear. 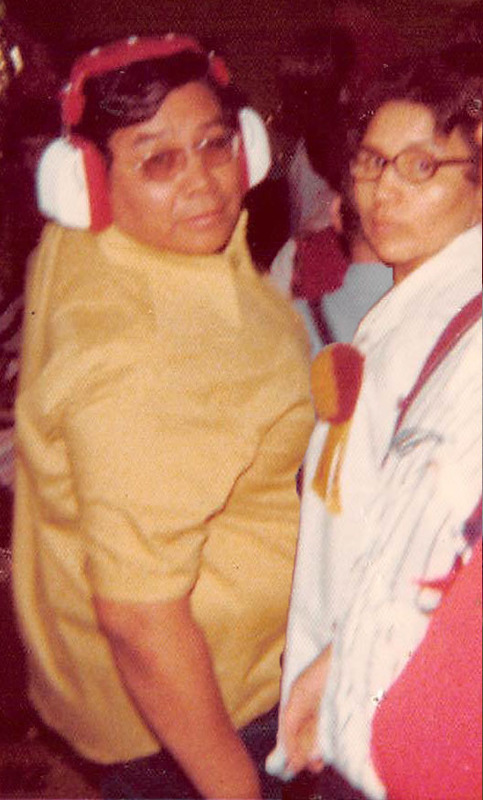 Carmelita EagleBoy attended schools in Poplar, MT and Pierre, SD. After her education she moved to Miles City, MT and waitressed at the Miles City Café. Upon returning she found work at the Poplar Community Hospital in housekeeping and later on she became the supervisor or Head of Housekeeping which she worked for 25 years. After retiring, she found work at A&S Industries, worked there until its closing. She then started work at FPCC and also attended classes in automotives, where she earned herself a certificate. She later found work at Sunrise Lumber Barn where she worked until retirement at age 73. Mom was a very strong woman with a heart of gold “one of a kind”. In 1956 she met Nelson EagleBoy. They married in Froid, MT on April 26, 1958. They were big fans of Poplar Indians. You could always see them at the games with their twin girls in tow. Carmelita leaves behind a large family her sons: Terry (Georelle) EagleBoy, adopted son Conrad Young. ; daughters Dreamis EagleBoy, Angelica “Angie” Wallowing Bull, Julia Young and Nicole Longee; sisters Marzetta Iron Bear, Bernadette (Mike) Dimas, Francine Two Bulls, Juanita (Doug) Youngman, Naomi Young, Ida Good Bird, Sylvia Cantrell and Velma Nepstad; brothers Charles “Bud” (Patsy) Two Bulls, Wayne (Evetta) Two Bulls, adopted brother Tom Escarcega; grandchildren Joshua Wallowing Bull, Sr., Charles (Kathy) RedBoy, John (Leah) McClammy, Choaya EagleBoy, Todd Spotted Wolf, Pearl DeMarrias, Jessica (Chance) Boyd, Natasha (David) Roberts of Portland, OR, Alyssa and Tammi EagleBoy, Laurel (Peanut) Cheek, Angeline and Casey Cheek, Keidra Big Leggins, Deona Eagle, Terrise Little Chief, Terri L. Youpee, Ronalee Carpetier; great-grandchildren Wallowing Bulls: Joshua, Jr., Angeline, Marie, Bear Cub, Kurt Wayne, Jessica Robyn; Red Boys: Alyssa, Michelle, Ryan and Haidyn; McClammy’s: Tristyn, Gavyn, Jada and Jenna; EagleBoys: Trey, Dante, Micah, James and Whisper, Carmen Boyd, Sierra Rue Country, Serenity and Jessa Little Chief, Zoey, Gabe, Joshua, Irie Roberts, Micah Joseph, Azzy Magnan, Cleo EagleBoy, Xyler, Tru Longee, Cecelia and Antoinette Wallowing Bull; nieces and nephews Angela Cheek, Trudy Snell, Joanita Snell, Jaunita Conradt, Cory Snell, Alfred Iron Bear, Charles Two Bulls, Jr., Tana Two Bulls, Angie (Tony ) Shields, Debbie (Howard) Azure, Darin (Jane) Dimas, Troy Dimas; her good friends Carlene Gibbs, Agnes Ward, Caroline Bighorn and her dog Cody. Mom joins her family in Heaven maternal and paternal grandparents; her parents; husband Nelson EagleBoy; daughters Angeline “Snookie” Wallowing Bull, Carmen EagleBoy, Antoinette “Toni” Wallowing Bull; sons Arnold “Choaya” EagleBoy, Kurt Wayne BigLeggins “Moonman” and Melvin EagleBoy; sisters Madeline Snell, Verna Two Bulls and LaVerda Eage Bear; brothers Robert Stretches Himself, Francis “Macky” Two bulls, Warren Two Bulls; extended families Snells, Two Bulls, Lamberts, Shields, Matrells, EagleBoys, Parshalls, Sparviers, Red Eagles, Yellow Owls, Dimas. Mom, Grama you know you’re so loved by your family and all those who knew you. Until we meet again. Condolences to the Family of Carmelita I am so sorry to hear about your loss. Prayers to the whole family in your time of sorrow. She was a great woman and will truly be missed. I am so sorry for the loss of your dear Mother. May God be with you all to give you all the comfort and strength today and everyday. Take comfort in knowing she was with you for 86 years…My hugs and prayers for you all my friend..your Mother was a strong lady..
Dreamis, may your mother rest in peace. She lived a long active life. I know she enjoyed bingo. My sincere sympathy to you and your family. Dreamis and family. I’m so sorry for your loss, my deepest condolence. Loads of hugs and prayers to Carmelita’s family. She was one of a kind. May your good memories keep her forever in your hearts. I worked with her at Fort Peck Community College many years ago. To the family of Carmelita EagleBoy my prays are with during your time of Loss . Carmelita will be missed very much. I will miss running into her at the casinos. May she rest in peace as she starts her journey. God bless you all. Bettie. My sister I’m so sorry for the loss of your mom, she was a kind sweet woman, very comical an had me laughing and always have great memories with her. Prayers to Dreamis and the family. Love and hugs at this difficult time.